Denise's doctor told her to wear a sleep apnea mask or lose weight. It was an easy decision. See how she lost 115 pounds in one year! I was a competitive gymnast when I was young, which helped me build a solid foundation of strength and flexibility, and a love for competing. After college, I became a municipal police officer and started my career as a patrol officer. After many years working various shifts, and several assignments and promotions later, I became significantly overweight, unfit, stressed out, and unhappy. I occasionally began to exercise and diet, and lost weight, but quickly lost motivation and gained the weight back and more. I kept outgrowing my police uniforms and needed larger gun belts. As a police captain, I felt embarrassed and ashamed about my size. I needed to set a better example for the officers I managed and for my teenage kids. My lower back was in chronic pain and I experienced regular migraine headaches. I was overly tired regardless of my amount of sleep. I took less pleasure in physical activities I used to enjoy like hiking and skiing. 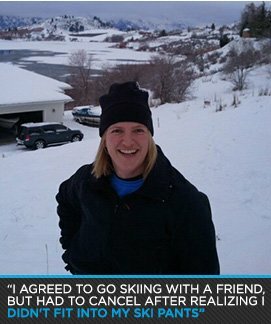 I agreed to go skiing with a friend, but had to cancel after realizing I didn't fit into my ski pants. I turned down social events and activities with friends constantly. In April 2012, I was invited to watch an acquaintance compete at the Emerald Cup in Bellevue, Washington. I'd never heard of figure or fitness competitions before and was inspired watching many of the competitors. It reminded me how much I used to love competing. I decided that day to get back into shape and lose weight. I fantasized about developing a physique that would enable me to compete at the Emerald Cup, but didn't believe I had the capability to achieve the leanness or muscularity necessary. I started with a long overdue health checkup. I avoided the doctor because I didn't want to step on the scale or accept that I was obese. At the doctor's office, I weighed 245 pounds and my blood pressure was borderline high. I was also diagnosed with sleep apnea and learned that a significant contributor and cause of apnea is obesity. I was upset with my health, but felt motivated to make changes in my life. I didn't want to wear the sleep apnea mask at night and I didn't want to take blood pressure medication. I quit eating junk and fast food, and began electronically journaling my food. My daily calories ranged from 1,200-1,600 and I weighed and measured food to ensure I ate correct portion sizes. Later, I stopped eating processed and prepackaged food, eliminated most bread and simple carbohydrates, and increased my green vegetables and protein intake. I started doing cardio 45 minutes per day on an elliptical, treadmill, or Stepmill, and took group classes like Zumba, Body Pump, step, and cycling. I never thought I would like group classes and always considered myself more of an independent type, but I had fun in the classes and made new friends. I found the class instructors motivational and it was nice to be in a supportive environment. I stayed consistent with my diet and exercise routine for several months and my weight steadily dropped. At the end of July 2012, I stepped on my scale and wanted to do back flips because I was less than 200 pounds. I was 198 pounds and felt proud. During the summer, I added outdoor biking to my exercise routine and took long rides on the weekends. I felt fitter and could see and feel my body shape change in a good way. By October 2012, I lost 75 pounds. My spin class instructor, Kristine Duba, was a fitness and figure competitor. Kristine told me she was a member of a team called, Save Fitness, and her coach was Tanji Johnson, an IFBB fitness champion. I told Kristine about my dream to compete at the Emerald Cup and she recommended I contact Tanji about joining the team. I contacted Tanji in November 2012. At the time, I weighed 170 pounds. I lost lots of weight, but still had a long way to go. Tanji assessed my physique and made several recommendations, including the importance for me to start a serious weightlifting program. I joined Save Fitness and felt a renewed energy to push harder. For the first time, I believed it was possible to compete. I began a serious weightlifting program and participated regularly in team activities and camps to learn about figure competitions. I practiced posing and learned suit selection, stage hair and makeup, tanning, and suit glue. At the same time, I made lots of new friendships with fitness-minded and supportive women on the team. I realized how much I isolated myself socially because of embarrassment and it felt good to connect with others again. I lost weight at a steady rate, but wasn't sure how to diet for a figure competition, so I consulted Pete Grubbs, owner of Construction Zone Fitness in Issaquah, Washington. Pete has vast amounts of nutrition expertise and works with figure competitors and bodybuilders. I met with Pete on a weekly basis, and he assessed my body composition and revised my diet and exercise plan so I could achieve my competition goals. On March 30, 2013, I competed in my first figure competition; The Tanji Johnson Classic in Vancouver, Washington. I wasn't expecting to place, but much to my surprise, I took home a fourth-place trophy from the Masters 40-plus class. On May 3, 2013, I achieved my goal to compete at the Emerald Cup. I competed in the Masters 40-plus class and placed third. I was separately called out on stage and presented with a Most Inspirational Award. It was an unbelievable and unforgettable experience. My last figure competition, the Empire Classic, was on May 11, 2013, in Spokane, Washington. I competed in the Masters 40-plus class and the Open Figure D class. I placed second in Masters and won the Open Figure D.
Throughout my journey, I never had days when I thought about quitting. I'm goal-oriented and found additional inspiration every time I achieved benchmarks and goals. It was challenging to drink enough water and complete meal prep. I carried a water bottle everywhere. During work, I took it to staff meetings and constantly refilled it. It took a long time to get used to frequent bathroom trips. It was helpful to purchase several assorted sizes of reusable Tupperware containers and set aside two times per week to cook and prepare food in advance. It was hard to stick with my diet at times and participate in certain social events with my friends like visiting wineries or going out to restaurants. During the last two months of competition prep, I stopped going to restaurants to be sure I didn't stray from my diet. I have several short- and long-term fitness goals. This summer, I participated in my first organized bicycling event. The first was the Seattle to Portland (STP) ride, a 2-day, 202-mile ride. 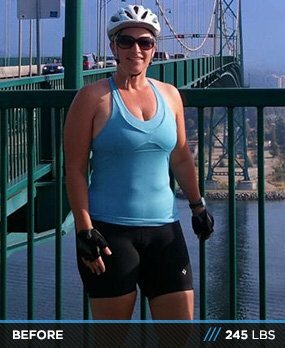 The second was the Ride from Seattle to Vancouver, British Columbia (RSVP), a two-day, 188-mile ride. I planned several hiking trips this summer, including hiking in Glacier National Park in Montana. I'm returning to the SaveFitness Team for the Summer/Fall season and plan to compete at an upcoming show in Washington in November. I have an interest to compete in figure again and am considering working toward physique. I will work to grow my muscles, gain more leanness, and prepare a physique posing routine. I also started a Facebook page called Denise Michelle Inspiring Transformations and get much satisfaction from helping to motivate and inspire others to work toward fulfilling their health and fitness goals. Take responsibility for being overweight and stop making excuses. Dieting is hard. Exercising is hard. Being overweight is hard. Choose your hard. Join a gym and take classes where you're be surrounded by support and motivation. Make sure to eat healthy and stick to appropriate calorie limits. Cut out junk food. Try non-fat Greek yogurt and mix it up with fresh or frozen fruit. Be patient. It took time to gain the weight and will take time to lose it. Forgive yourself. Everyone has struggles. Don't give up. It's not too late. You can do it. Baby steps are okay. You don't have to start out running. Since I made the decision to compete in figure competitions, Bodybuilding.com has been my go-to resource for workout and exercise tips, supplements, and connecting with fitness-minded people. I view the forums regularly for suggestions and ideas. My favorite Bodybuilding.com article author is Layne Norton. I have an immense level of respect for Layne (and a huge celebrity crush) and appreciated his articles on peak week.